With our windswept sun wall art, you can bring a dramatic, artistic look to an outdoor porch, garden wall or patio. 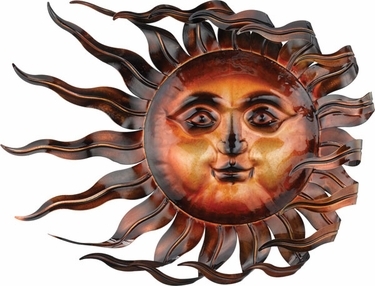 One of our many outdoor hanging metal sun faces, this one literally looks as though the sun is in flight, and at 26 inches long, it will make a big impression. This Wind and Sun outdoor wall decor also makes a very special gift, and is perfect as a housewarming present. It is made from durable metal with a dark bronze glaze. It also works very well indoors, as a centerpiece on a living room, den or indoor porch wall. Try placing near indoor plants for a warm and inviting nature scene. At GardenFun, we have a bright selection of outdoor sun decorations that would look beautiful on any backyard deck, or as a warm reminder of the natural world when placed in an office setting. This piece honors the sun and the wind. We also have other wind decorations such as our wind spinners and also wind chimes. Even more impressive than this picture can show, you will love how this sun decor instantly brings beauty and warmth into your life. Size: 26"L x 19.5"H x 3"D inches.